W-18 is 100-times stronger than fentanyl. Alberta has rolled out thousands of overdose kits to help combat a growing fentanyl crisis in the province, but the kits may be powerless against an even more dangerous new opioid on the market. Last week, Calgary police confirmed a 35-year-old man's overdose may have been due to the presence of W-18 in his system. In 2015, fentanyl was to blame for 274 overdose deaths in Alberta, according to the province's government. 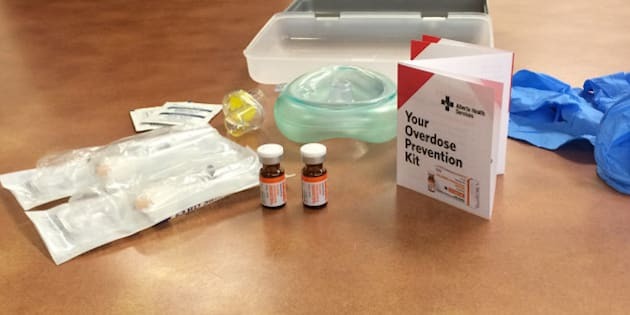 Alberta Health distributed nearly 10,000 naloxone overdose kits designed to temporarily reverse an opioid overdose, in an effort to fight back against fentanyl's growing hold on the province. The take-home kits are available at harm-reduction agencies, as well as pharmacies and walk-in clinics with a prescription. "We don't know if W18 is binding to the same receptors in the brain that... naloxone bind to." The kits, however, might not reverse a W-18 overdose, largely because the way the drug works is unknown. "There is very limited information on the pharmacology of W-18 so we don't know if W-18 is binding to the same receptors in the brain that opioids, such as heroin and morphine, and opioid antagonists, such as naloxone, bind to," harm reduction specialist Ashraf Amlani told the Globe and Mail. Another issue is the drug's strength. The B.C. Centre for Disease Control believes W-18 may be too powerful for naloxone to work, Global News reported. There is one small piece of good news. The formula behind the drug might also hold the key to an equally strong cure. University of Alberta scientists first developed the drug in the 1980s, according to the National Post. Those scientists, who never tested the drug on humans, looked at both opioids and antidotes. "In addition to the ones that had varying degrees of analgesic activity there were also compounds that were developed in that series which were actually antagonists , they would actually block the actions of things like morphine at the receptor, so it had no effect," retired U of A professor Ed Knaus told the Calgary Sun. Until another cure is developed, health officials say the current best option for W-18 users is still naloxone. "If people are exposed to W-18 and they have symptoms of overdose, same as fentanyl, they should take naloxone and call 911,'' Dr. Laura Calhoun of Alberta Health Services told The Canadian Press.